On Happiness. My reactions to reading "Flow." I’ve read a lot of books about improving yourself and improving your life. These books tend to focus on how to change your circumstances to be more in-line with how you want your life to be. This book was quite different. It’s not about becoming healthier and wealthier. It focuses on learning how to control your attention and your attitude in such a way as to more thoroughly enjoy yourself in everyday activities. 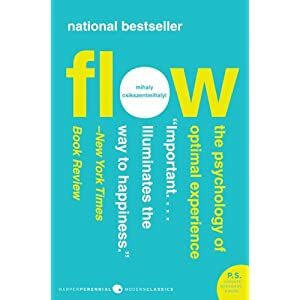 Flow: The Psychology of Optimal Experience (P.S.) by Mihaly Csikszentmihalyi (No, I have no clue how to pronounce that either). In the past, I’ve fallen victim to the mentality that happiness is, by and large, something that is dependent on your circumstances. Our consumerist society instills in us a strong belief that if we were wealthy and had infinite time for for leisure, we’d be happy. In reality, that’s not the case. People with all the time and money in the world are often times no happier than a bum on the streets (if you don’t believe that, read the book). I’ll confess, I’ve bought into that false belief. I already knew that money doesn’t by happiness, but whenever someone stated that cliché that I would always say: “True, money doesn’t buy happiness, but neither does poverty.” Of course, by that I meant that it’s better to be wealthy than to be poor. After reading this book I’ve realized that I was in some ways totally right by saying “neither does poverty.” Neither wealth nor poverty can buy happiness. In fact, happiness is not very closely tied to money or circumstances at all. By pointing out empirical evidence in my own life, as well as lots of supporting studies is that my attitude is what ultimately determines my happiness. The good news in that is that attitude and attention is something that we can actually learn to control. This concept was quite eye-opening for me. I’m not doing the concept justice, the book explains it much better than I do. Be warned: at times, the book is kinda dry and dull, and in my opinion it’s a bit too academic. I think the book could have been condensed to half its length and been better for it. Also, be aware that the author tends to explain religion and God as merely having been invented as a means of experiencing “flow.” In fact, the book gets a bit odd in the last chapter, because he argues that we should essentially embrace science and our ongoing evolution as our “religion.” As a Christian, I don’t agree, but that doesn’t take away from the many great points and recommendations the author makes in the rest of the book. Despite it’s shortcomings, this is a book that has already changed how I approach my life. I definitely think I’ll be better and happier for it. I highly recommend it.